Editor’s Note: A previous version of this story misspelled the last name of Laura Handy-Oldham. PHOENIX – When parents brings kids to Phoenix Children’s Hospital, their concerns often extend beyond medical care to what they are entitled to under their health care coverage, be it an employer’s plan or the state’s Medicaid system. To ease that confusion, the hospital now offers Family Financial Services, with a team of certified counselors ready to help with those questions. 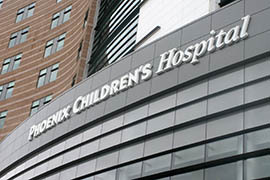 To create the team, Phoenix Children’s revamped its operation that had provided help to offer counselors certified through the marketplace, Handy-Oldham said. In addition to helping families understand their insurance options, the counselors also work with the parents and make sure they know what is expected of them financially before they come in for appointments or procedures. This helps the families understand what they will have to pay out of pocket, what their insurance is covering and what its not, and what their options are for covering that, Handy-Oldham said. Dr. Daniel Derksen, director of the University of Arizona’s Center for Rural Health, said Arizona’s demographics make helping people navigate health insurance more important here. Maura Carley, author of the book “Health Insurance: Navigating Traps and Gaps,” said it’s common for people to need help understanding their coverage options. Handy-Oldham said the program can save families thousands of dollars. “You feel good at the end of the day when you are able to do that,” she said. Phoenix Children's Hospital has created a team of certified counselors to help parents navigate the complexities of their health care coverage, be it an employer plan or the state's Medicaid system.